2019 Spring Break Rec Camp (K - 8th Grade Boys and Girls) Registration is open to all Kindergarten through 8th Grade boys and girls. Cost for the camp is $99. Registration is online ...Click here to Register. Camp will be held from 9-11:30am Monday, March 25 through Thursday, March 28 at Hazelia Field. CAMP LOCATION WILL BE DETERMINED AT A LATER DATE. DUE TO THE CONSTRUCTION WORK AT LAKERIDGE JUNIOR HIGH SCHOOL WE ARE WAITING TO HEAR WHAT FIELDS WILL BE AVAILABLE FOR OUR CAMPS. WE WILL UPDATE THE PAGE AS SOON AS WE FIND OUT. THIS IS INFORMATION FROM OUR 2018 PROGRAM. 2019 INFORMATION WILL BE UPDATED SOON. This program is designed for the player looking for more instruction from our classic, high school and college level coaches. Sessions will consist of technical skills and small sided games. We welcome all players grades K-2nd that are looking for "something more". Many of our past YDP players are currently playing within our Oswego Juniors and Classic programs. Dominic Yambasu, former LOHS Varsity Coach and current LOSC Classic Coach, will be the lead coach for this program. This camp is geared towards 5th, 6th , 7th, and 8th graders for the Fall of 2018. The aim of the camp will be to try and help the players develop in the above areas and help them develop in preparation for the upcoming Fall Soccer season. Please contact: fraser@losc.org if you have any questions. Our camps blend many elements to provide a great experience for as many campers as possible. Our coaches have a blend of experience ranging from club directors to local high school players to ensure we have coaches who can lead the camp and coaches who interact well with the campers. We utilize soccer games and exercise that engage the campers and develop their skills without the campers even realizing it. Then of course the campers spend time playing small sided scrimmage games where they get to use the skills they have been working on. At lunchtime we entertain the campers with 'joke time' and then daily competitions such as crazy hat, crazy shirt, crazy shorts, and crazy socks! As part of our commitment to the community through our Summer Camp Program LOSC makes a donation back to each of the High School Soccer Program's in Lake Oswego. Our Summer Soccer Camps are directed and organized by LOSC Director of Coaching - Fraser Morrison. Morrison intially came to the USA in 1995 to work as a Soccer Camp Instructor. Since then he has been involved in running soccer camps in Oregon, Washington, Idaho, and California. Morrison's philospohy on camps is that the players involved should be in a fun environment and they should learn and improve soccer skills without even knowing it. 'We use a variety of different soccer specific and non-soccer specific exercises that allow players to develop a wide variety of individual technical skills' Morrison said when asked for his views on the LOSC Summer Camp experience. Our camp staff is balanced between USSF A Licensed Coaches (the highest level of coaching license available in the USA) to local players from Lake Oswego and Lakeridge High School's Soccer Program's. In order to provide balance we will place coaches of different experience with each group. For 2017 other staff will include but not be limited to Pete Roberts, Louie Jones, Chrissy Rumpakis, Ally Rumpakis, John Martin, and as already mentioned, members of local High School Soccer Program's. Pete Roberts is USSF A Licensed Coach who has been involved in coaching at the Summer Camps for the past several years. Louie Jones is a UEFA Licensed Coach who has over 5 years coaching Summer Camps on the West Coast. 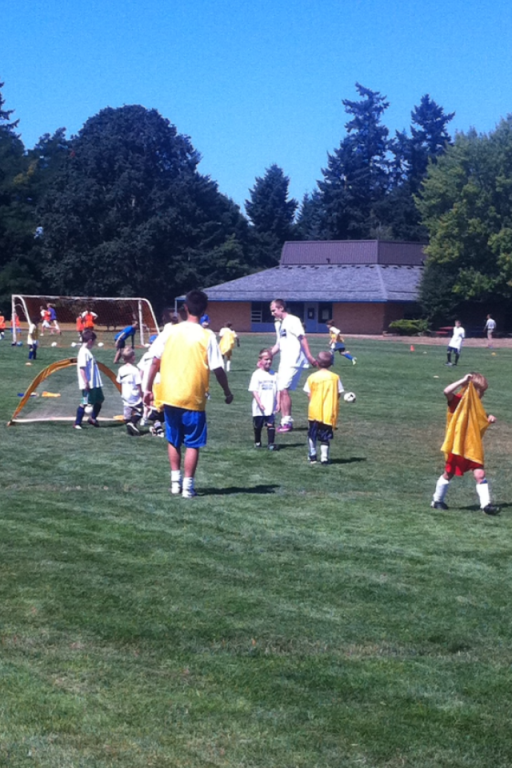 Other staff coaches involved have all gone through the Lake Oswego Soccer Club. Many of them either play soccer in college or have played soccer in college. Our camps are designed to suit soccer players of differing levels. The games and exercises employed in our daily camp curriculum expose players to the soccer ball as much as possible. Over the course of the day players will work with a ball and develop their skills in the process without even realising it. Copyright © 2001 - 2019 Lake Oswego Soccer Club. All Rights Reserved.